Terrace Station homestead and garden date from the late 1850s. Driving in, one is struck by the ’Capability Brown’ plantings of trees across the landscape with Mount Hutt featuring as a backdrop. Gradually the view draws in until one is driving along a tunnel of towering Sequoiadendron giganteum (Wellingtonia) on one side and Cedrus Atlantica on the other. It is thought the Wellingtonia were planted to commemorate Queen Victoria’s Diamond Jubilee in 1897; the Cedars were planted in the 1940s. 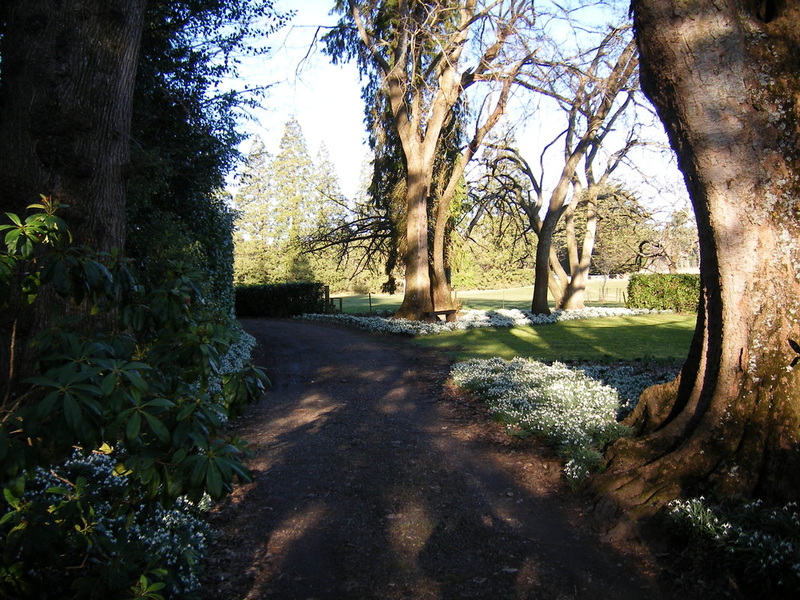 The route continues along a hedge-lined driveway to the historic homestead. Four large trees define the 19th century eastern side of the garden – Elm, Sycamore, Portugese Laurel, Hornbeam. 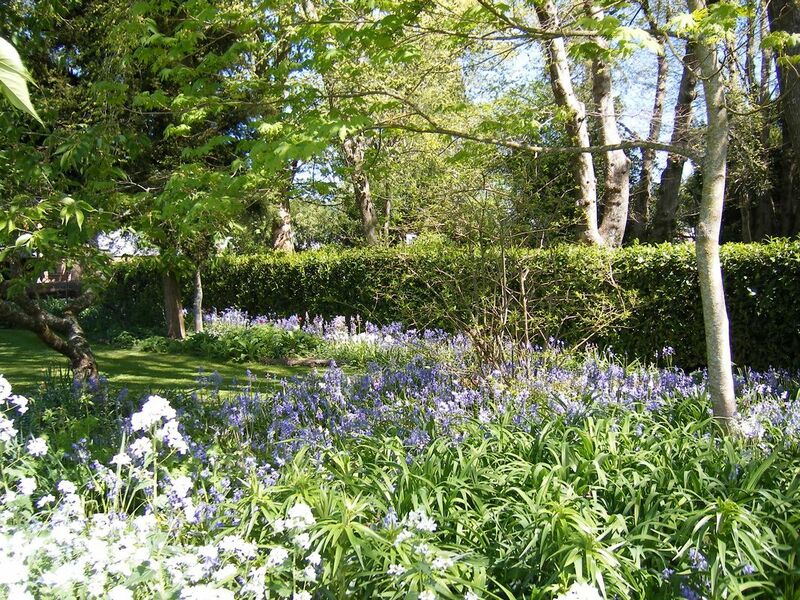 The garden has strong formal design features from the Victorian era and has adapted with a relaxed informality that suits the present gardeners, Richard and Kate Foster. Do not expect extreme neatness, but be prepared for surprises when you spend time in this extensive woodland garden. It is a very restful and uncontrived place with mass planting of bulbs, perennials and herbaceous plants. Notable features are the magnificent trees, the vistas from one garden room to another, the effects of light and shade on the tree trunks. The beauty of the bare trees showing different their forms can be enjoyed during winter and early spring. By October, every shade of green is seen. 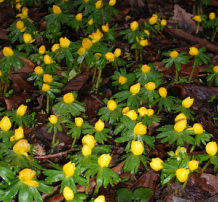 The first flowers in July are the winter aconites and hellebores followed in August by the expanses of galanthus nivalis (snowdrops). Then come violets, crocuses, primroses, daffodils and bluebells. Throughout the changing seasons there are always some colourful treasures to be found. In autumn the wood cyclamen and colchicums lead us into the winter flowers of white nerines, iris stylosa and celandine. There are wild areas with unexpected garden art and places that some visitors may see as being full of weeds ..... but “one gardener’s weeds are another gardener’s treasures”! Visits to the Garden and Homestead can be arranged by prior appointment. Two open days are held in the autumn and four in Spring. See Garden Visit Dates page.